Just imagine- Only a day left to a grand party or some important gathering and you see that bunch of ugly pimples appear on your face. Stressful, right? Many of you must also be facing the issue of mulish acne scars wrecking all your face. Such scars and pimple breakouts dissuade many of us from stepping out of our houses, thinking “what will others think or say about me”. Now to get rid of this situation, what is the best available option: Observing a healthy anti-acne skincare routine? Consulting a good dermatologist? Or, eating a nourishing diet? Well, without a doubt, all three options are very important for securing a healthy skin. However, they are all long term processes. Also, there is no surety that observing a good skin care routine for one full day will help you achieve a flawless and radiant looking skin for your party. This is actually when you need to try other resorts like makeup or more precisely, some non-comedogenic formulation that conceals your acne and scars. These foundations are not only quick, but they also work absolutely well in camouflaging all the flaws and achieving the skin of your dreams. Through this post, you will know how exactly they work. Alcohol Based / Fragrance Loaded Products: Such type of products are generally marked as “denatured or SD “products. It is advisable for all people to try and avoid these products, especially, people having an acne prone skin, as they can easily stimulate an allergy and further aggravate the condition. Thick & Solid makeup: These are the products that come as compact creamy or stick foundations and concealers. The ingredients added to such kind of products that keep them in a solid form are extremely harmful to the skin. Undoubtedly these foundations offer the easiest and fastest way of covering up acne and scars, but do you want this benefit at the prize of more breakouts? Well, I am sure not. In this post, we have laid down a number of alternatives that can help you clear your condition and avoid further breakouts. Below are top 5 handpicked non-comedogenic foundations for your skin. 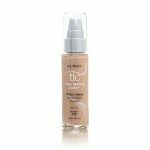 Almay TLC Non-Comedogenic Foundation is a long lasting liquid foundation that claims to stay in place for as long as 16 hours. It serves as an effective base that gives full coverage and at the same time, acts as a hydrating and nourishing moisturizer because of the anti-oxidants present in it. All types of skin. Not suitable for exceptionally oily skin. Zinc Oxide- an essential mineral that seeks to soothe skin. Treats skin inflammation and redness. Titanium Dioxide- Acts as a lubricating and skin whitening agent. Long stay foundation that lasts for almost 16 hours. It perfectly conceals all redness, scars, and marks. Rich in vitamin E that helps in improving the skin texture as well as lemon extracts that seek to brighten the skin tone, making it look radiant. Rich in zinc oxide which tightens the skin pores and stops the excessive secretion of sebum, thus reducing the emergence of pimples and blackheads. Non-comedogenic and hypoallergenic product. Suitable for even the most sensitive skin type. For oily skin type and you experience some greasiness after the application, simply put a small amount of mineral powder to have a well settled and matte look. 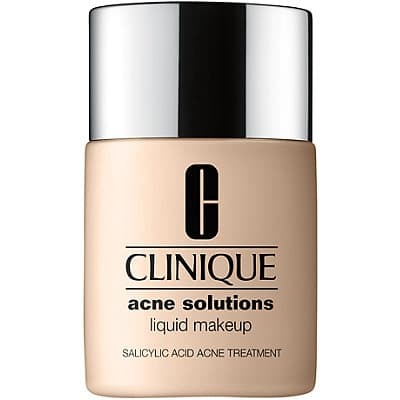 Clinique Acne Foundation is an anti-blemish liquid foundation that perfectly covers up all acne and breakouts, giving you an even and radiant looking skin. All types of skin. Dry to combination to oily. Not ideal for the exceptionally dry skin. Salicylic Acid- It helps to treat skin acne and greatly reduce all inflammation and redness. The product is extremely lightweight and the texture is immensely rich and silky soft. It sets in quickly and does not aggravate the condition of large skin pores. Non-comedogenic and works great for acute acne problems such as nodules and cysts. It also helps in achieving a better and improved skin tone. It provides a matte finish that perfectly conceals all your skin flaws on the face. It comes in an array of color options. Contains traces of denatured alcohol which may cause some serious allergic reaction to people having a sensitive skin type. Sensitive skin may also face the problems of skin oxidation due to your skin PH level. People with a dry skin may experience pimple breakouts if the salicylic acid in the product reacts negatively with the skin. Make use of a damp sponge piece to apply an even base coat. Try a moisturizer before applying the foundation if you witness that your skin feels tight and dried after the application, and then blend well. 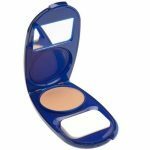 Covergirl CG Smoothers Aquasmooth Compact Foundation is an amazing formulation, enriched with all essential minerals, vitamins, antioxidants, sun protection and moisturizing properties. It is an ideal formula for covering up all your skin imperfections in the best possible manner. All types of skin. Not ideal for the exceptionally dry skin. The product comes in a very silky rich texture and offers lasting skin coverage. Rich in vitamin E, B3 and B5 that intensely moisturizes your skin. May appear little cakey especially on dry skin as the product is absolutely free from oil. Never leave sponge wet as it causes the production of acne bacteria. 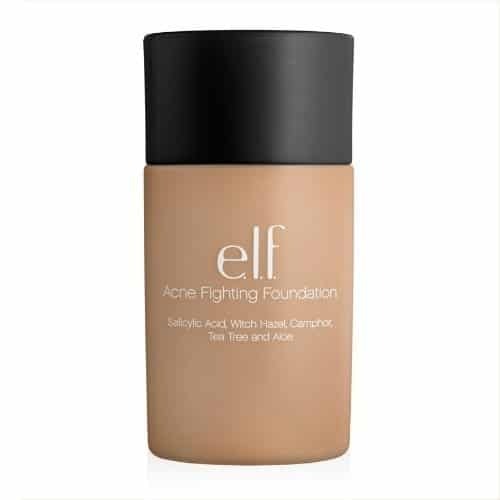 Elf Acne Fighting Foundation is a great product specially formulated to treat acne scarred skin. It is enriched with acne battling ingredients such as soothing aloe vera, salicylic acid, and tea tree extracts. It offers optimal coverage and conceals all redness, blemishes, and breakouts. All types of skin especially sensitive and acne prone skin. It helps in achieving a beautiful matte finish by perfectly concealing all nodules and pimple breakouts on the face. 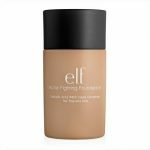 The formulation is very lightweight and doesn’t block the skin pores. It allows the skin to respire and look healthy. Salicylic acid helps in getting rid of all dead skin cells and reduces skin redness and inflammation. It does not settle into the fine lines and stay intact even in the humid weather by preventing excess oil secretion. It is available for a cost effective price. The product contains minor traces of witch hazel water and camphor bark oil which may cause skin allergy. The product PH is not adequately low for the essential salicylic acid to act as an exfoliator. This may trigger a negative reaction. Has a slight medicinal smell owing to the presence of acne battle ingredients. 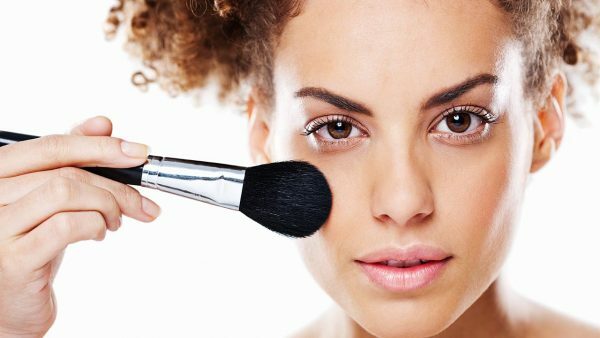 Simply dab a little foundation on the face and apply it with a help of a brush. If you find the foundation too matte, just dust a little powder t balance the look. 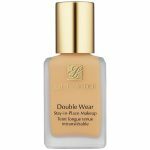 Estee Lauder Double Wear Stay-in-Place Foundation is a two-in-one formula that works as a foundation as well as a sun-protecting lotion. 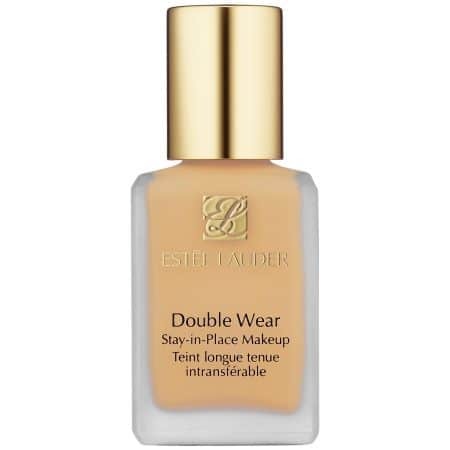 This liquid foundation offers great coverage. Trimethylsiloxysilicate: Offers optimal resistance against water in skincare. Dimethicone: Acts like a moisturizer that treats dry and flaky skin. The foundation offers long lasting coverage that can stay up to 15 hours. It gives you a natural and gorgeous look by perfectly concealing all the scars and pimples. It works best for people having an oily skin. The elements of Trimethylsiloxysilicate control and regulate the oil secretion. Doesn’t melt in high temperatures. Offers SPF 10 that protects the skin from pimples and breakouts. Comes in a number of shade options. You can comfortably choose the one that matches your skin color precisely. You need to remove this foundation with the help of makeup remover only. Using any normal facewash will not serve the purpose as it is a long lasting formulation. Any attempt to remove it without a proper remover may result in breakouts. Dimethicone may trigger some allergic reaction to people having a sensitive skin type. Just a little amount of the foundation is enough. Put it on a sponge, pat on the face to apply. A small amount of moisturizer may be needed if the skin feels dry or tight. Do not rub while removing this foundation. It may lead to some rashes or skin redness. 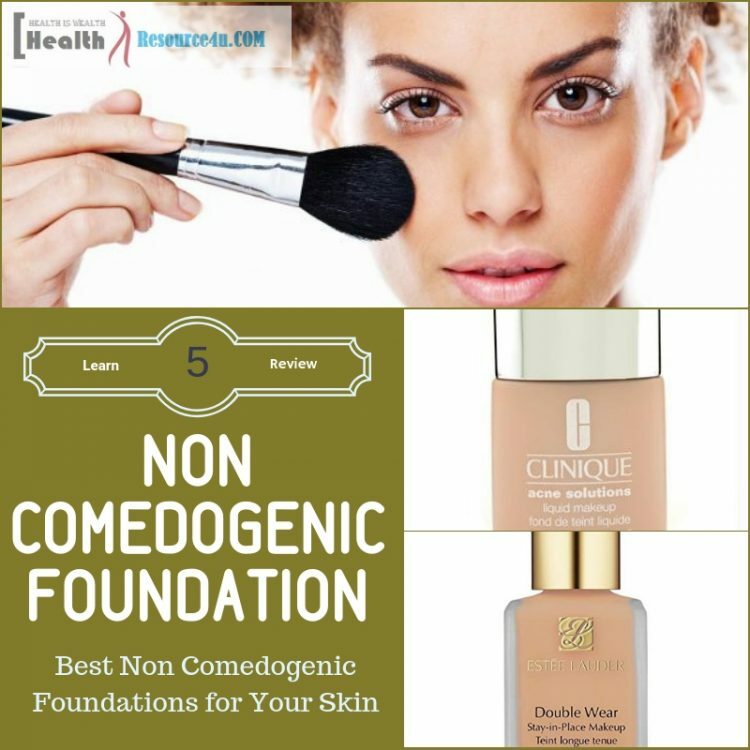 Using a noncomedogenic foundation is not only helpful for people with an acne prone skin. All skin types can greatly benefit from such foundations as they are not only gentle but also seek to improve your current skin conditions. Choose your favorite product and buy it on Amazon today!